As students in Philadelphia and Chicago resist draconian budget cuts, organizers across the country build for August’s National Student Power Convergence. E-mail questions, tips or proposals to studentmovement@thenation.com. For earlier dispatches, check out posts from January 18, February 1, February 15, March 1, March 15, April 2, April 15, April 26, May 10, May 24 and June 7. The budget for the School District of Philadelphia, passed by the unelected School Reform Commission, cuts all arts, sports, music, counselors and support staff. Nearly 4,000 pink slips were handed out in the past two weeks. At the end of June, the state will vote on funding for education in Philadelphia. Meanwhile, $400 million is being allocated for building new prisons. 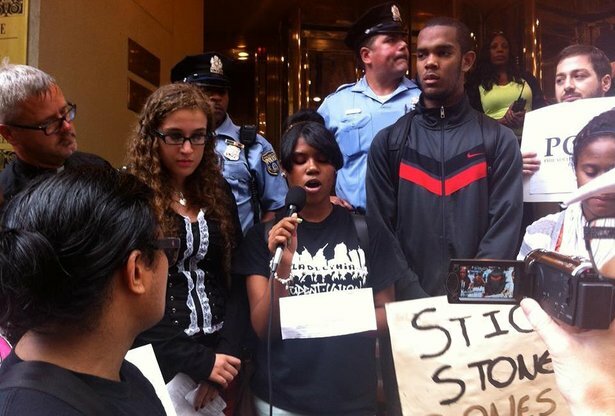 On June 14, members of the Philadelphia Student Union joined with Philadelphians Organized to Witness, Empower & Rebuild to demand funding for education in Philadelphia and across the state of Pennsylvania. We mobilized at Governor Corbett’s office in Philadelphia after a march that included parents, students and faith leaders. On June 25, PSU will be joining hundreds of other students and allies from across the state to rally at the capitol in Harrisburg. Less than a month after the unelected board’s decision to close fifty schools, Chicago Public Schools is implementing massive budget cuts, based a per-pupil funding system that prioritizes funding for charter schools over CPS schools. Though CPS CEO Barbara Byrd Bennett has stated that any budget cuts would not be felt in the classroom, parents, students and teachers are furious as principals now have to cut resources, lay off teachers and, in some cases, decide whether or not the school will have enough funding for necessities like toilet paper. On June 18, demonstrators gathered outside of Chase Bank headquarters to protest, holding a toilet paper drive to emphasize the absurdity on the cuts. Students are planning to protest the cuts during the board meeting next Wednesday, June 26, during their last week of school. After the Senate filibustered the DREAM Act in 2010, the New York State Youth Leadership Council launched a campaign for the New York DREAM Act, demanding full access to healthcare, financial aid, driver’s licenses and work permits for undocumented youth in New York. Over the past two years, youth have organized mass lobby days, marched 150 miles on foot from New York City to the state capitol and engaged in civil disobedience to advocate for the bill. Because the original bill didn’t get enough support, our demands got restricted to financial aid. This version recently passed in the state assembly—but the real fight has always been to get the Republican State Senate and our Democratic Governor, Andrew Cuomo, to support it. In July, undocumented youth will take the campaign to Long Island to escalate pressure on state senators there. From August 1 to 5, students from across the country will converge on Madison, Wisconsin, for the second annual National Student Power Convergence, to build a student and youth movement covering local, state and nationwide issues. With only a month to go, students from across New Mexico, Colorado, Arizona and Nevada are mobilizing across movements and fundraising from local organizations through the Movement Summer program. In the Southwest, activists have been working on myriad issues affecting our generation—from college affordability and youth unemployment to advancing immigrant rights and ending the school-to-prison pipeline. In Albuquerque, students are currently begining a dialogue about the never-ending tuition hikes at the University of New Mexico, totaling 170 percent in increases over the past fifteen years. In the coming weeks, students will begin educating peers and community members about the most recent hikes. Organizers from this campaign plan to strategize with students from other states working on tuition and affordability issues at August’s convergence. Movement Summer has nine core organizers across the country tasked with building power for the National Student Power Convergence by mobilizing student groups from within established regional and statewide organizations, such as New Jersey United Students. In New Jersey, New York, Pennsylvania and Delaware, our outreach ranges from national organizations such as United Students Against Sweatshops and Students for Sensible Drug Policy to high school groups, including the Philadelphia Student Union and Newark Student Union. Organizers are also working with universities to connect with students in programs that prioritize financial aid for low-income, first-generation, rural or urban students. As part of Movement Summer, New Jersey’s EOF Organizing Project was launched in May to work with these programs by organizing summer tours and running student-led voter registration drive. By the convergence, the goal is to help build student coalitions in Pennsylvania and Delaware, which, by the fall, would organize budget campaigns to reallocate state funds into higher education aid and grant programs. In the run-up to the National Student Power Convergence, the Student Union of Michigan held the Michigan Student Power Convergence on June 15 in Ann Arbor, with more than fifty students and faculty from the University of Michigan, Michigan State, Eastern Michigan, Wayne State and Mott’s Junior College in Flint. Through presentations and small group discussions, we spent the day outlining the structure of the modern university, clarifying the need for strong student and worker voices on campuses and running crash courses in one-on-one and campaign-based organizing. At the close of the convergence, attendees committed to bringing these new skills to bear on their campuses and to maintaining the connections we had formed. A key part of this was the decision to construct a statewide information clearinghouse called the Michigan Student Solidarity Network to help coordinate and share news and campaign materials between campuses. Chicago is in the middle of a voter registration crisis, especially among young people—more than 500,000 eligible residents are not registered to vote, and millennials in Illinois are rated forty-seventh in the country for voting in local elections. In early 2013, Chicago Votes, a youth-driven organization dedicated to expanding democratic participation in Chicago, took on the fight for online voter registration. Our volunteers circulated petitions, sent thousands of e-mails and hundreds of phone calls to lawmakers and forged partnerships with environmental advocates, LGBT rights organizations and others. At a crucial moment in the legislative session, the Chicago Tribune ran an op-ed by Chicago Votes’s leadership supporting the bill. Thanks in part to our aggressive campaign, the bill passed both houses. Governor Quinn is expected to sign it into law this summer. 8. A New Home for the People’s Arts Collective? In New Haven, Connecticut, a city with a reputation for unemployment and crime, residents have expressed the tremendous need for opportunities for young people. In this context arose the People’s Arts Collective, which unites art, education and community organizing in programs like the New Haven Free Skool, which offers free classes on everything from web design to police brutality, and the LGBTQ* Youth Kickback, which provides a safe space and free programming for queer youth. PAC’s downtown location has enabled unprecedented interaction between New Haven residents and the Yale community—a huge step forward in a traditionally fraught town-gown relationship. But a new development at 196 College Street means that PAC is in danger of losing its space. A coalition of residents, artists, high school students, activists and Yale undergraduates are organizing to ensure that PAC has a new home, that there is more community input in the development process and that New Haven creates more spaces that are accessible to youth and low-income people. 9. A New Era of Rank-and-File Democracy? 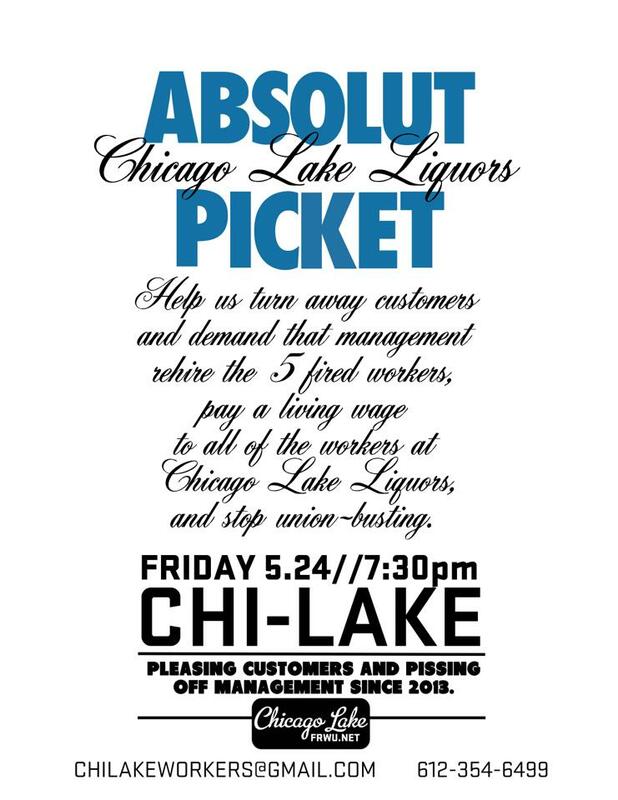 In late March, thirteen young workers at Minneapolis’s Chicago-Lake Liquors signed a letter asking management for a $1 raise in starting pay, $1 across the board and $2.50 added to the pay cap. In retaliation, five workers were fired the following week. Since then, workers have held four pickets and other actions, and have been leafleting outside the store to inform customers of the company’s violations. On May 27, the National Labor Relations Board announced it has found merit in the wrongful termination case put forth by the Chicago Lake Liquors Five. Workers are now waiting to see if the company will attempt to settle or take the case to court and are mobilizing the community for a boycott of the store on July 4 if the fired workers have not returned by then. A belief in the power of direct action, shop floor organization and class solidarity also informs our work in AFSCME Council 5’s new and young worker affiliate, Next Wave Minnesota, which is currently engaged in democratizing AFSCME locals and organizing direct actions and community outreach for upcoming contract negotiations. From June 14 to 16, graduating students from seven West Coast universities wore stickers and signed petitions in favor of Senator Elizabeth Warren’s Bank on Student Loan Fairness Act, which would lower student loan interest rates to 0.75 percent—the same rate the big banks get. Students collaborated to build a micro-site to post the photos taken at graduation, which also gives people the opportunity to show support for Senator Warren’s bill. In addition to gathering video testimonies and photos, students held a conference call with Senator Warren, and then, at the ceremonies themselves, spoke to parents as they checked in. Across the country, students are continuing to advocate for a vote before the legislative session is over.